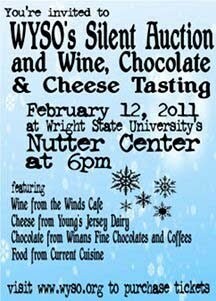 Have you gotten your tickets yet for the WYSO Silent Auction, Wine, Cheese and Chocolate Tasting? They're only $35 each if you get yours by Friday, February 11th. Otherwise, they'll be $40 at the door on the night of the event. So, click here to purchase your tickets now. We'll be accepting donations until next Friday, February 4th. So don't wait any longer.